"Thanksgiving is nothing if not a glad and reverent lifting of the heart to God in honor and praise for His goodness." Sip a steamy mug of cocoa, listen to inspiring music, and relax while you piece together a beautiful puzzle. How to Enter: Whether you're planning a trip, signing up for a class, or completing a creative project, share one goal you plan to achieve in the new year. I'll post some of the entries in a future update. 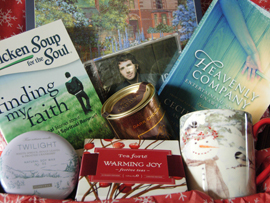 Box contains: Chicken Soup for the Soul Finding My Faith, Heavenly Company Entertaining Angels Unaware, Josh Groban All that Echoes cd, Chickadee Snowman Mug from Lang, Tea Forte Warming Joy, Godiva Hot Cocoa, Twilight natural soy candle from Paddywax, and Lupines puzzle from Lang. Each Christmas our neighborhood exchanges plates of homemade cookies, sparkling cider with candy canes tied with ribbons, and other small tokens. For the first time in years I made this light fluffy gingerbread last November. My oldest granddaughter, Charity, enjoyed the tasty treat so much that she requested it for her 13th birthday cake! Cream together ½ Cup soft Butter and ½ Cup Sugar. Add in 1 Cup hot water and beat until smooth. If using unsalted butter add ½ teas. Salt. Pour batter into greased 9x13" dish and Bake at *350 for 25-30 minutes. If you lightly press your finger on top of gingerbread and the indentation springs back, the cake is done. Let cool. Serve plain, with whipped cream, or drizzle with icing. You can find this recipe on p.84 in The Tasha Tudor Cookbook Recipes and Reminiscences from Corgi Cottage. Jane - A group from our church started the idea. I joined in because my parents started "Bucket of Joy" for the needy in our county. We all helped get toys, mittens, and treats in a bucket, and each child also received a big toy. It took us all year to get it done-Mom redid dolls, made clothes, and refurbished old toys as we could afford. When my parents died a church group in another county took over "Bucket of Joy." I also prepare for The Shoe Party held the first Sat. in December. We ask local businesses to donate money-we don't have many as we are a small town of 215 or so. We get a great deal on shoes from Kmart. Each child gets a brand new pair, socks, mittens or gloves, scarf, and then usually a stuffed animal. The honor society usually paints the kids' faces. Also, the church has given books, coloring books, colors and the like. We established a fund at the local church and they help us all they can. Denise - The greatest thing I give back is through our church. We pack 1000 boxes for Thanksgiving and distribute some in our county, but most in inner city Baltimore through another church. The recipients are prequalified through social services to make sure they go to those in need. A year ago at this time I shared with readers my granddaughter had been hit by a vehicle in front of her school. When you read the news many of you wrote to say you were praying for her. For weeks our family worried along with doctors that she would lose her leg. Today her foot still swells with too much activity, but she walks and is thrilled to wear regular shoes again. Kaylen not only survived the accident, but experienced an outpouring of love and support that amazed her. In her words, "I didn't know so many people cared about me." What so easily could have been a tragedy, and was a trauma to our family, God used for good. We give thanks to the Lord for Kaylen and thank you for your prayers! Mix sauce and cinnamon in a small bowl until you form a ball, as you would when making pie dough. Flatten ball somewhat and place between two sheets of wax paper. Roll dough to 1/8 - ¼ inches thick. Cut out desired shapes using cookie cutters. Smooth away any rough edges using your fingers or a butter knife. 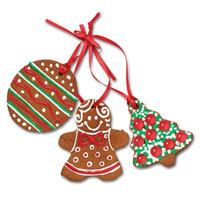 Avoid touching front and back of ornaments until dry because you will leave fingerprints. Let dry for about an hour. Using a kabob skewer or nail head, poke a hole in the top of each ornament large enough to tie cord or ribbon through. This is when I make indentations like stitch marks around the edges, or make eyes and a smile on my gingerbread people. Let shapes dry on parchment paper for about 5-7 days. To dry evenly turn several times during drying process. I made bows from 1/8 inch satin ribbon to glue on my gingerbread men. I still hang these cute decorations I made with my kids twenty years ago. *Note: Ornaments are not edible. Things to do: Make a leaf garland. 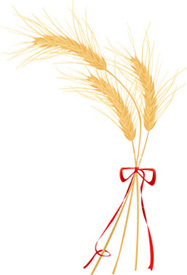 Use leaf cookie cutters and string your various shaped leaves on ribbon or jute. Hang above a doorway. I made a braid of jute and glued 3 red ribbon bows spaced evenly apart. In between each bow, I glued gingerbread man. Give you neighbors an ornament with their Christmas card. On the Sunday after Thanksgiving light the first purple candle which reminds us that God revealed Christ's coming through the prophets hundreds of years before His birth. And that Christ brought light into the world. The following Sunday light the prophecy candle along with the purple Bethlehem candle which points to the birth of Christ and his humanity, the Word made flesh. Light the first two candles and the rose colored Shepherds candle. The Shepherds candle reminds us that like the shepherds we must come to Christ, believe in Him, and tell others the Good News. Light the purple Angels candle with the first three candles. The Angels candle reminds us to focus on Christ's finished work of salvation and to anticipate His second coming. 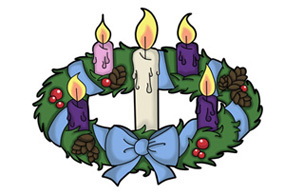 Light the first four candles and conclude your advent celebration on Christmas day by lighting the white Christ candle. As we light the final candle we acknowledge that Jesus Christ, Light of World, is born today. To read the story of our family's first Advent celebration visit the articles page and click on "A Fresh View of Christmas." Sue - Years ago a friend shared that when Thanksgiving arrived she would write to someone from her past she was thankful for. She thanked them and would recount what they had done that touched her life in such a special way. I can't say I have done this each year, but I have done it some years and it is such a refreshing thing to do. God is so good and desires that we would be a people of thankfulness and bless others too! Lydia - I love baking Christmas cookies with our grandkids. I have Nativity-shaped cutters, so we tell or read the Christmas story with the baked cookies, and they each get to take home a set of frosted shepherds, sheep, angels, wise men, stars, and holy family. I love to pass on the real meaning of Christmas. I made each grandchild a Christmas apron with his or her name on it that they wear when cooking at Grandma's house. Check your local Christian bookstore for Nativity-shaped cutters or order online. Cindy - At Thanksgiving, my family has a time-honored tradition of joining our hands together while in a circle and stating what we're thankful for! It is a special time for us; as the years pass it has become somewhat bittersweet because we have lost many family members. Reminiscing has made me thankful for the time we shared with lost loved ones! Tami - Throughout the holidays, it's all about family and friends gathering together to celebrate this wonderful time of the year. The day after Thanksgiving, our family tradition is to drive to Coeur d'Alene, Idaho for the candle lighting ceremony. We enjoy singing carols, looking through shops, and drinking hot chocolate all bundled up standing outside with our candles to watch the quaint resort town light up with Christmas lights. Linda - Christmas Eve we all attend church together, then we listen to The Messiah while we eat clam chowder, homemade bread sticks, cheese and apples. Then a special ornament for that year is given each family member and hung on the tree. Christmas morning we all sleep in, have a late breakfast, and finish opening gifts after noon. Every year the same holiday traditions take place and we hold them all dear to our hearts. I specifically like setting out the small wooden crèches that my four sons made and painted when they were each five years old.